Are you a beer fan?Â Have you ever tried beer served from a cask?Â If you like beer and you’ve never had a cask beer, you should check out NERAX North – New England Real Ale Exhibition. 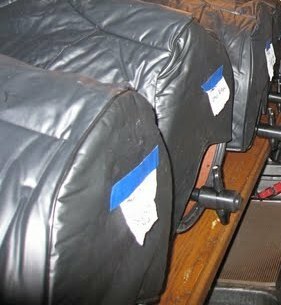 [Obviously, all cask beer fans are welcome too].Â The three day cask beer festival starts on November 5th, 2009 in Haverhill, MA and will showcase 34+ cask conditioned beers from over 18 regional breweries and 9 international breweries. NERAX North is a satellite event held by the NERAX organization.Â Recently, NERAX hosted their first ever event in Maine (at Novare Res), along with their original festival in Sommerville, often held in March/April. NERAX is organized by CASC, the Cask-Conditioned Ale Support Campaign. CASC is an all-volunteer organization dedicated to boosting awareness of and demand for Real Ale in New England. Real ale is a top-fermented beer that completes its secondary fermentation in the from which it is served. Cask-conditioned beers are real ales served from the brewer’s cask. Flavor and texture is what real ale is all about. Lovers of cask-conditioned beers enjoy the broader range of flavors that result from the clear, naturally carbonated ale served at cellar temperatures. There is less gassiness, less head on the beer, more beer in a glass! Some devotees of the approach want to drink nothing else. Real ale can be served by gravity from a tap, or drawn with a hand pump, electric air pump, or Scottish tall font. No pressurized or additional gas is added except atmospheric air as the cask is emptied. The ideal serving temperature is cellar temperature, about 55Â° F.
WHEN: November 5th – 7th, 2009. Thursday 6:30 – 10:00 p.m.
Friday 6:30 – 10:00 p.m.
Saturday 1:00 – 7:00 p.m. Drink Craft Beer, You’ve Earned It! !